Get on your Boris Bike in London! Although they weren’t originally his idea, Mayor of London Boris Johnson found that the timing of his term of office and the alliteration from his name meant the blue pushbikes you see all over London now bear his name. 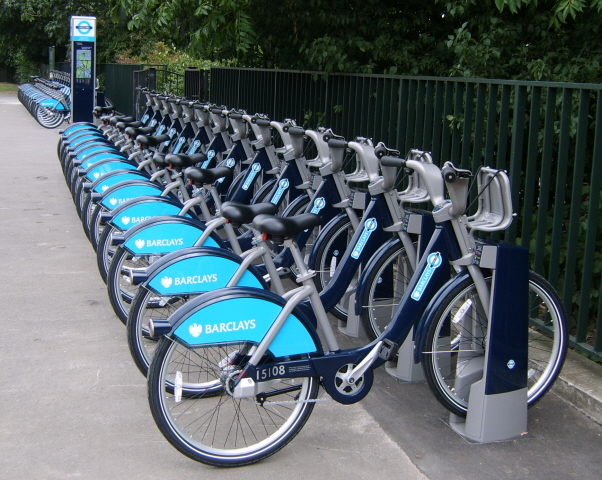 The Boris Bikes, or Barclays Cycle Hire as they are officially known, are stationed all over the city in electronic racks that allow users to hire a bike and roam on two wheels, dodging the stationary traffic and stuffy Underground. With the newly marked cycle superhighway routes that go from Aldgate to Westminster and everywhere in between, getting on a bike in the city has never been easier. With lanes that steer you away from traffic wherever possible, you’ll be able to get from A to B in short order and potentially save yourself some money. To find out where your nearest rack of Boris Bikes can be found, log onto the cycle hire section of the Transport for London website and search where you are. You’ll get directions to your nearest rack and can check how many cycles are available for hire. A rack full of Boris Bikes, waiting for action! Once you get to the rack, you’ll be asked to use a credit card to release a bike from the pay point. One day’s access is only £1 and in your 24 hour period you can take a bike from the rack as many times as you like. The first 30 minutes of every hire is free, and this will usually get you to where you want to be. After your free 30 minutes the charges are £1 for up to an hour, £4 for up to 90 minutes escalating to a maximum of £50 for a 24 hour period. However, once you’ve docked your bike in one of the racks you’re free to hire again after ten minutes. The Transport forLondonwebsite also allows you to plan your route on your bike. The newly completed cycle superhighways run from the outskirts ofLondonto the centre from every direction, allowing you to skip the Tube or the bus and get on your bike instead. Regular users can get a quick-access keyfob, but you can just use your credit card. In addition to these work-a-day cycle paths, you can find a number of leisure routes around some ofLondon’s most beautiful open spaces. In West London, a path takes you on a circuit along the Tamsin Trail aroundRichmondParkwhile on Hampstead Heath you can dock your bike and take a dip in the ponds for a swim while in the area. Many of these routes aroundLondon’s parks and waterways are inaccessible to cars making them a perfect way to explore London in peace and safety away from the traffic. In an effort to add some incentive for cycling around London, Transport forLondonhave joined forces with Recyclebank to develop the Re:route app for iPhone. Aimed at cyclists and walkers, the app allows you to record your walks and bike rides around the city to earn points towards free treats such as haircuts or money off your shopping. If you’re planning to spend more time in the city on foot or on two wheels, it’s well worth taking advantage of these offers. Cycling around London is easy, fun and safer than ever with the opening of the cycle superhighways and route planners that steer you away from busy roads. Let your Boris Bike save you from the stifling heat of the Tube in summer and see the city as you’ve never seen it before. I used to love cycling, or simply riding a bicycle. Until olympics was hosted in London. And i wonder where would i like to visiting london or riding a bike. And came to a wild imagination that hoping that being born an olympians. I imagined how lucky they were. Many of my friends live in central London and it’s a fact that they prefer biking over commuting. And this rent-a-bike system is going all over Europe now Jane, thanks for covering London. More clean travel, happier travelers!